AI will deliberately tamper with your online gameplay as you scramble for more in-game items to win. Proposed in which an AI is used to analyze the socioeconomic status of each game player and allow the game to take “best profit strategy” for individual players. That way is to consistently tamper the player’s game experience “away from the player’s desired result” and accelerate waste in the game by causing unequal results. The same AI will manipulate your state of mind (social engineering) at every step of your game to guide you towards more micro-transactions. 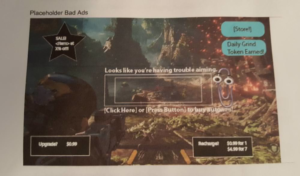 After buying the game, you’re used by a tool, designed to spend more money (monetization) if you want to achieve your desired result. 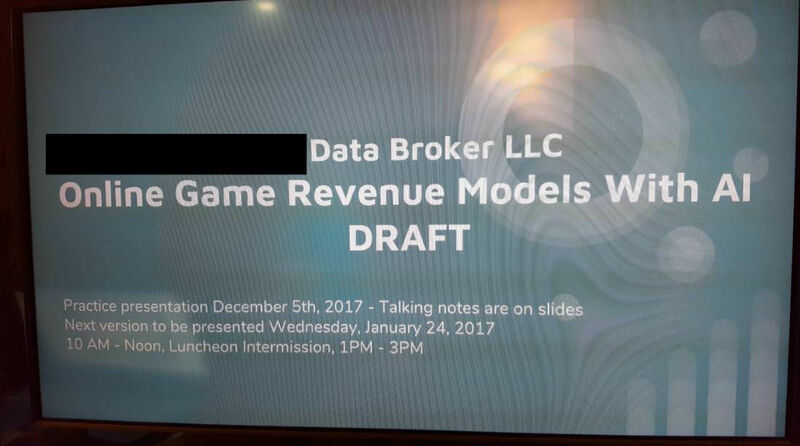 The paper’s slide-deck and signed papers (with corrections) were leaked to the web by an unknown source, with bits of information (names, brands) redacted. It has too much information to be dismissed off hand for being a prank. It proposes leveraging AI to gather and build a socio-economic profile of a player to implement the best revenue-generation strategy. 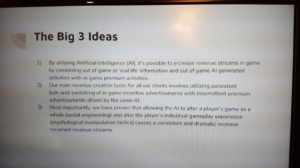 It also proposes using an AI to consistently “alter” the player’s gameplay, such that the player’s actions don’t have the desired result leading toward beating the game, but towards an “unfair” consequence that motivates more in-game spending. The presentation spans a little over 50 slides, and is rich in text that requires little further explanation. You can find the rest of the slides on TechPowerUp. Breakfast: How Do You Start Off Your Week? Copyright © 2019 - Jan Broeer - Off With The Boot!